Several years ago, Bev had, what seemed to be a crazy idea, living in Newburyport, to raise bees. 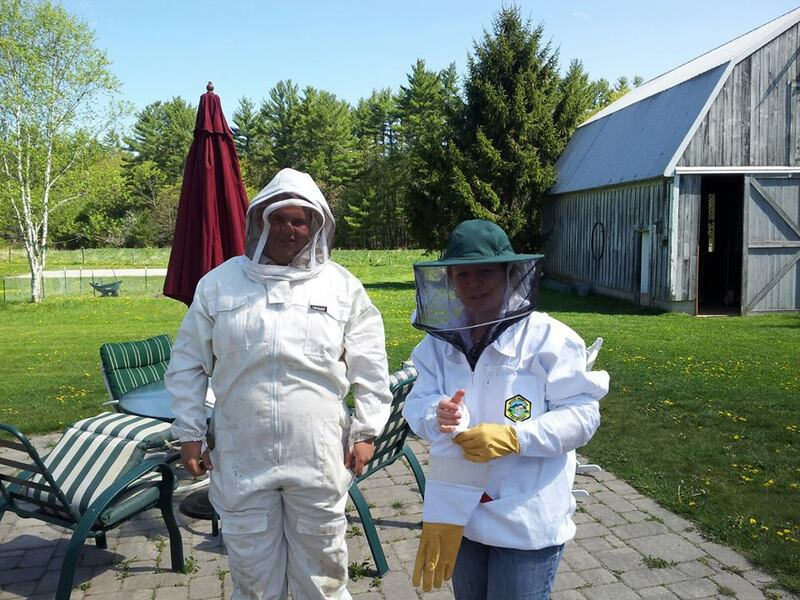 She enrolled in a course, first in Massachusetts, then in Springvale, to learn more about bees and hive management. She talked about and read several books. I was less passionate about it, although one of my best friends also had a fascination for bees and honey that rubbed off on me. It always seemed like a far off idea. 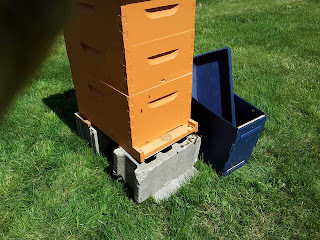 This hive was purchased at Bee Pride in Lebanon Maine this spring. Bev's son and ex built a different type of hive, called a top bar that appears on the left below. 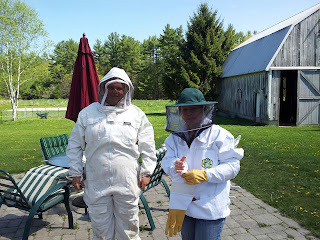 Bev met Brandon at the bee class early this spring. Brandon also raises goats at his family's farm, and started his first hive two weeks ago. 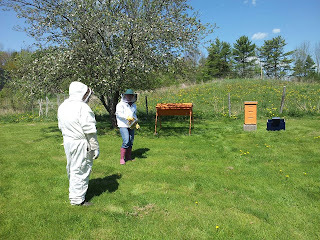 We all suited up, and Brandon led the transfer of the bees from the transport box into their new home. Almost immediately, several bees positioned themselves at the entrance of the hive and began fanning with their wings. I was told this is done because the queen emits a pheromone that when dispersed by fanning will let the other members of the hive know that she is inside, and this is home! 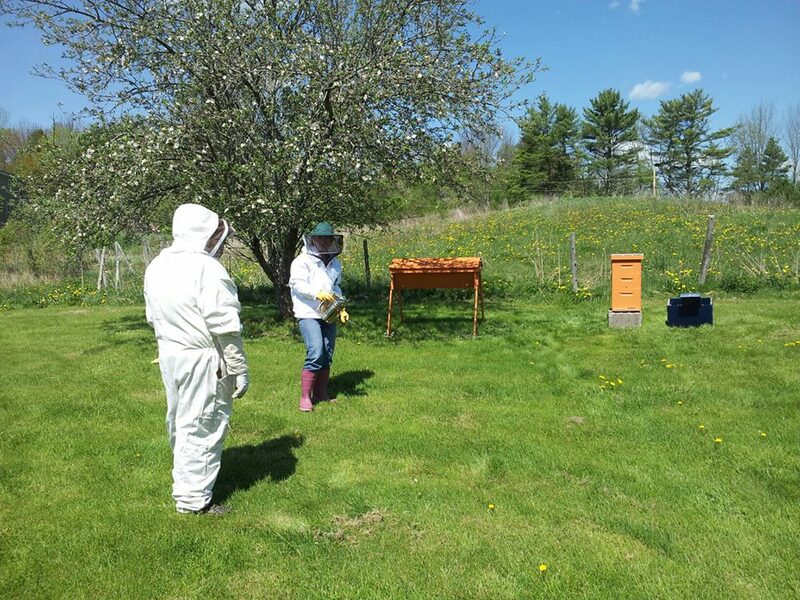 The bees will spend the day recovering from their move from Vermont, arranging the hive to their liking, and be prepared to spread out into the dandelions and budding fruit trees nearby. Bev's smile says it all! What happened to winter? The last blog post was "Winter Coming, and here we are the second week of May as this is written, trying to catch up with all the fun since the first snow storm. 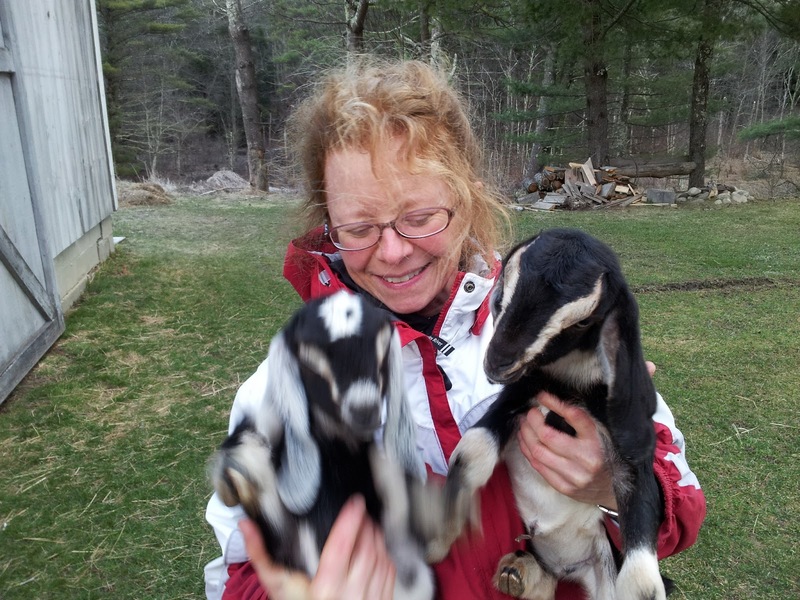 The big additions this spring are the 4 kids! Simon and Twenty One Guns both had two kids each. 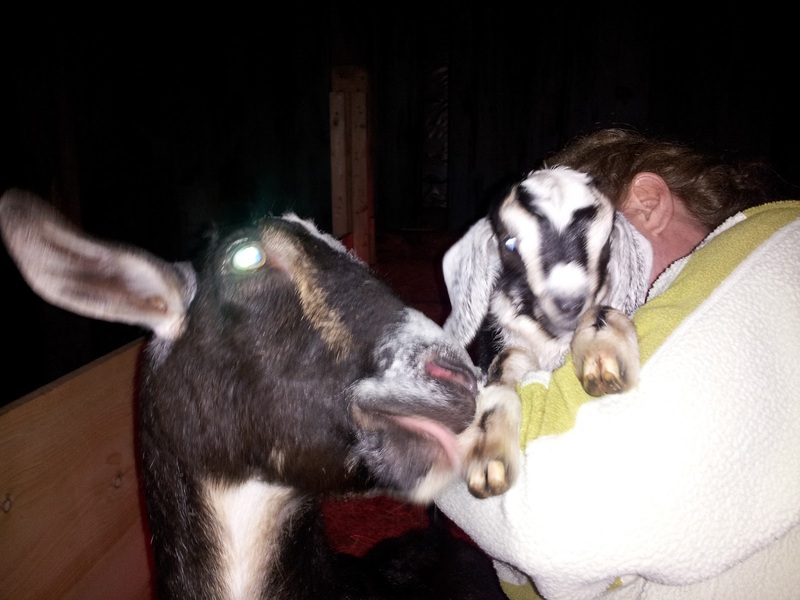 Twenty One Guns had two doelings and Simone two bucklings (do you know anyone looking for a great wether for a companion? 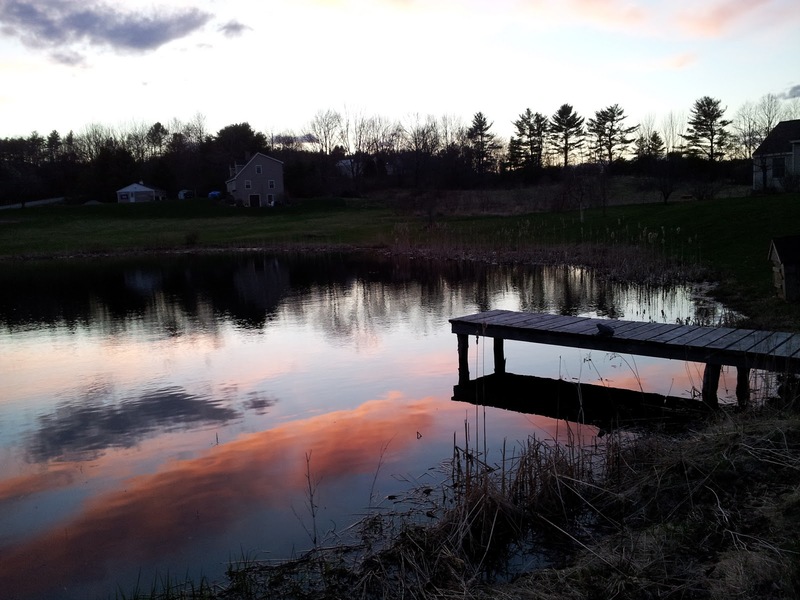 Watching the pond come alive this spring has been quite a thought provoking show. The ice seemed slow to let go, then suddenly it vanished, inviting a Cormorant, a Morganza pair, a Mallard pair, and a brief visit from a pair of Canadian geese we hoped were passing through. It became clear that our Mr. Duck had his work cut out for him reclaiming the pond for he and Mrs. Duck. With the exception of the Cormorant who is still looking for a mate, he has run the others off! With the exception of Mr. Duck's antics around the pond, I noticed throughout the winter months when the ducks shared the barn with the other critters, I observed the ducks made an inseparable pair. One can only guess at what is being communicated, but they are constantly chattering back and forth, and Mr. Duck always seems to have a plan! "What would Mr. Duck do?" has been my mantra as the spring morphs into summer and the weather this year seems reluctantly to moderate. 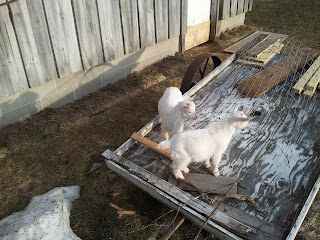 Manley and Half Pint, the "Barn Buddies"